"Works very well - Really Cute!" 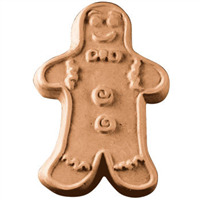 COMMENTS: makes perfect little gingerbread man embeds for rimmed or loaf soaps. COMMENTS: My little gingerbread man soaps are so cute. The mold held together and after 2 hours peeled right out of the mold. COMMENTS: This mold was easy to fill, I had no problem with the seams leaking as stated in the Heart mold. The first fill did bow a bit in the middle, so I waited for a bit thicker trace on the second attempt. It unmolds easily, and little clean up is needed after. I am deciding on which one to choose next:) I don't use colors, so I am using the vanilla content to my advantage, filling the mold with unscented soap and placing the white Gingerbread man in a soap that has a color or vise versa. The mold is shorter than my bar mold, so I cut the Gingerbread soap to the match the length up to the last bar. Not sure what I'm going to do with the little Gingerbread men pieces left over, but I'm sure I'll find something!!! • Very little trimming is needed. • Wish it was just a tad bit longer. "great for Christmas or for children soaps"
"I need a bear mold to use as an embed for m&p soap. Does this resemble a bear when and it's taken out of the mold? It looks bear shaped but I'm not sure. Thank you. " Staff Answer This does look like a gingerbread man but it is up to you if you want to use it as a bear embed. "How many oz of soap does this hold?" This mold holds about 10 to 12oz of soap. 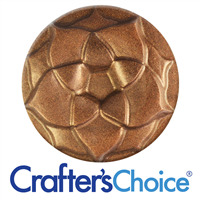 "Are these molds safe for Hot Process Soapmaking?" Staff Answer These molds can withstand temps up to 400º F and should be fine for HP Soapmaking. Yes and they are silicone, so removal is very easy. Just make sure to really squish your hot process soap down in all the crevices so there are no air pockets.